Appalachia is an enduring region with old-growth forests, weathered farmhouses made of wood, and extensive family lineages. With an expanse from Eastern Mississippi to Southern New York, this mountain range is the essential American landscape. Anyone who’s had the opportunity to relax on a hand-hewn bench on a porch overlooking a valley in mid-Spring is well-aware of the wordless sounds that spill out trying to describe the sensation of witnessing such a beautiful land. The age and history of Appalachia ensures that artists descended from the region will always be influenced by the shapeless inspiration of the ancient mountains. Confirming this place-based influence, Currey & Company released at the October High Point Market, the Elkmont Collection of furniture, a series that is full of allusions and very obvious references to Appalachia. 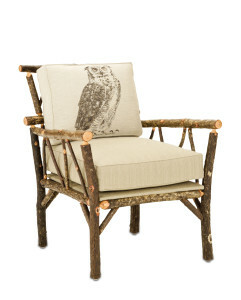 Built by mountain-based craftsmen, each product in the Elkmont Collection is centered on the use of bark and branches of poplar and hickory harvested from North Georgia. The Elkmont Collection was manufactured by the same craftsmen who originally made birdhouses for Currey & Company over 20 years ago. The Elkmont Collection features two mirrors, two tables, a sideboard and a chair with options for upholstery including fabrics and leathers. 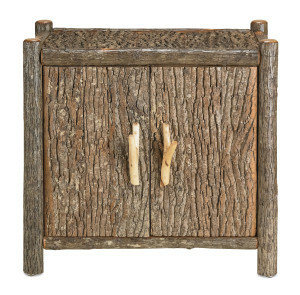 All the pieces reflect Appalachian durability and age with a rustic centerpiece to the aesthetic. 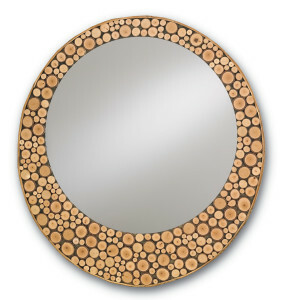 The most distinctive selection from the series is the Round Mirror. Immediately, the mirror alludes to a lake in a clearing surrounded by a grove of old-growth trees. The glass reflects pure, glacial mountain water, and the surrounding stems of hickory create a crescent shaped frame. It seems like looking into the mirror would deceive you into thinking a forest surrounded you. However, this design has been liberated from the typical “mountain rustica” mind-set and would fit into a more contemporary interior with its minimalist style. Each selection from the Elkmont Collection is an expert example of the simplified use of rustic wood in furniture design that prioritizes the natural beauty of the material instead of cluttering it with finishes and modifications. 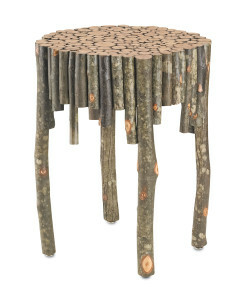 By leaving most of the wood alone, the designers at Currey & Company and the skilled craftsmen created an ode to the Appalachian wilderness. This entry was posted in Currey & Company, Products and tagged cabinets, design trends, Education, Furniture, Leather, mirrors, Natural, occasional tables, Rustic, seating, Wood on November 19, 2013 by Currey & Company.